The Power to pay tag, a smart alternative to carrying cash around. 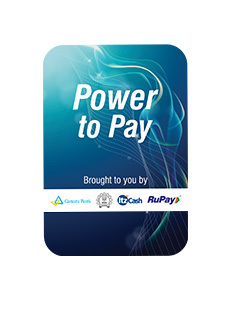 The Power To Pay Tag is India’s first & unique, multi-purpose co-branded contactless prepaid payment instrument developed with the latest Near Field Communication technology (NFC) issued by ItzCash Card Ltd in collaboration with IIT-Bombay and supported by the National Payments Corporation of India and Canara Bank. It is a smart and effective alternative to carrying cash to make payments for various services in and around the IIT-B campus. It is simple, convenient and safe to use. It empowers the customer and provides control to use the Tag securely at retail outlets equipped with a Point-of-Sale terminal to make payments. Access your funds stored on the Tag – anytime and from anywhere. The tag can be stuck at the back of your cell phone – thus ensuring that it is always with you and can be always available when you need to make any payments. The simplest way to pay! Allows you to live life – stress free!